1. Inspire others to follow the MnP method and bring to life maps that are waiting dormant in your itchy little brains. 2. Reveal the overall reason just why an MnP map is fun – in our humble opinions. What a question! If I had a chocolate bar for every time one of us asked that, I’d be sick. But that’s usually the question we ask one another right before one of us goes on to describe a Worms map that we would love to play on. And it’s an important question. Because at the root of all Worms maps is this overly vital issue: Is it gonna be awesome? A. The Overall Theme – To a certain extent, you can pretty much create anything you can think of as a worms level. The theme is only limited by your imagination. But, your theme should be something you are really passionate about. That passion is going to bleed through to the final product. B. Uniqueness – While many ideas for worms maps might end up looking great, not all are going to be a great gaming experience. This is why we usually choose very specific map ideas and development them. Our maps usually have something unorthodox about them, something that makes them special, at least to us. C. It’s Gotta Make Sense – The map idea has to be convincing. The setting of your map should be real to you. It should have a history. If you are developing a map that comes from a part of real-world history, then the battle is half over. But if not, invent a history for your map. This will help you focus on the finished product, and fuel the fire until the work is done. D. Invent a Scheme – Is this really all that important? And why are we doing this before we actually draw anything? Because if you really want to convince a player that your setting is worth playing, you’ll need to know from the beginning just how your map will be played out. Think of the weapons you’ll be allowing, the time limits, the random objects. All of this will round out the theme of map and it’s at this point that you will be ready to start putting the ideas on paper. PART 2 – To the drawing board! A. Size does matter – In Worms Armageddon you don’t have too many limits for map dimensions, while in Worms Reloaded you do. In either case, visualize your size limits and keep that in mind for your sketch. B. Proportions – Keep in mind we are talking about worms here. MnP loves making maps with real buildings and vehicles that you can battle it out in. We use a proportional scale that allows us to keep the same sizes for objects across all of our maps. When you start working on the graphics, you can use a screen grab of a worm, but while sketching the map on paper, remember how big objects should really be in relation to each other. C. Rooms, rooms, rooms – Use this opportunity to flesh out where the “rooms” will be. This doesn’t only refer to actual rooms, but to open spaces as well; anywhere that a worm can walk and fight. As you determine the open spaces, your map’s general layout should emerge. D. Imagine how a battle will play out – Think about how the layout that you created will actually be played by gamers. If you are designing forts, do you see any obvious balance issues? If it is simply a normal terrain, can you tell where the bottle necks will be? Can you think of ways to create challenges for players; difficult places to reach, great defensive and offensive positions, etc. After putting a little ink on paper, you should have a pretty good sense of what you want to create. Your mind should already begin to see the final product. You have something to focus on, and that’s very important. Every MnP map that I have EVER designed has started on a piece of scrap paper. Trust me, it works. PART 3 – To the digital drawing board! OK, so there are a lot of options out there for designing maps and for digital artwork in general. If you want something free, GIMP is decent and of course MS.Paint. We use Adobe Fireworks CS5. It’s original purpose is for website design, but it works pretty stinking good for Worms map design as well. One of the secrets to creating a real good map is to do everything yourself. You may be tempted to go find some graphics on Google Image Search and use them in your map. That’s fine, but it will take away from the continuity (and originality) of your map. That’s why we design everything from scratch and we do it using vectors. 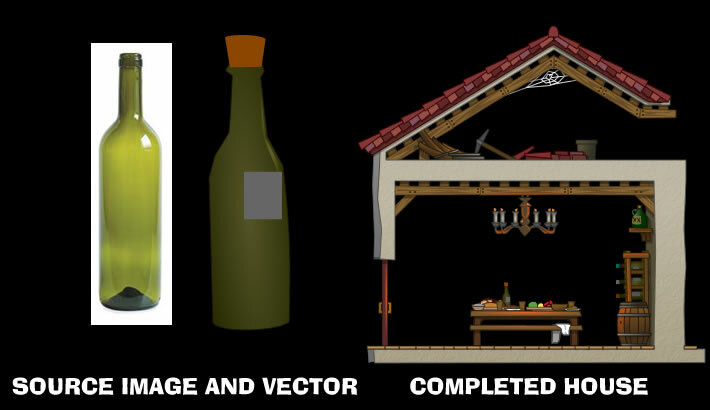 Personally, I would never be able to teach someone how to become a vector artist. Therefore, the following two sites offer some incredible help for designing with vectors in Fireworks. There are even samples that you can download, to see how something was made. It should be very helpful. Let’s assume that you’ve gotten some vector experience under your belt. What next? How do we get that pen and paper sketch and turn it into something great? As an example, we are going to use a basic house. The house from Scurvy is a good one. it’s the one that is nestled in the middle of the EIC fort on the bottom floor. A. General Layout – This is the part where you define the overall map. Essentially, you are transferring your basic shapes from the paper to the computer. Concentrate on large shapes. If you are designing a house, draw a nice big square for the bottom half, and a triangular roof for the top. It doesn’t have to be perfect, just the general shape of the house. B. Creating Spaces – Next, we’ll want to define the rooms in the house. In Scurvy, notice that house with the attic. The shape of the house is split by an attic and a downstairs area (dining room). So what you want to do is use your path editing tools (like punch, intersect, and union) to define the walkable areas in the house. Punch is very useful as you can make another shape (like the triangular attic) and place it over the basic house shape. Then you select both shapes and press the Punch button, cutting a nice hole in the house in the exact shape that you placed over it. You’ll want to Punch a square shape out of the bottom portion of the house and a triangular shape out of the top (to make the attic). You can use Punch to cut doorways and windows into the house, or Union to join two shapes together to add bulk to the house. Below is our house before we started punching out areas, and after as well. 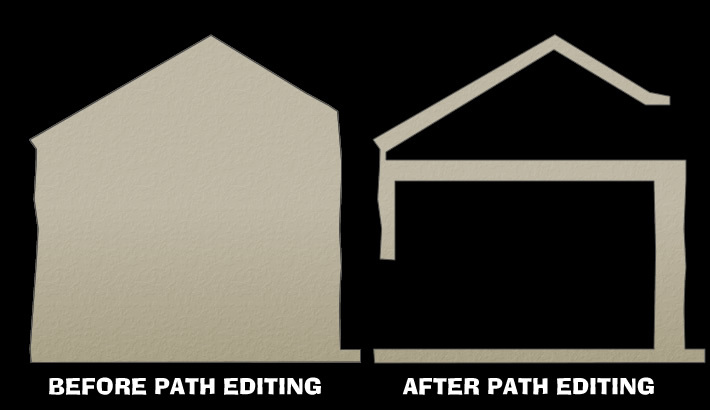 For more help with Fireworks Path Editing tools like Punch, Union and Intersect, go here. One important thing to remember is proportions. I always use a small graphic of a worm (from both Worms Armageddon and Worms Reloaded) so that I can see exactly how much room there is to play in. All MnP maps now have a standard for proportions that we follow to make sure our maps are contiguous. C. Raise the Roof – OK, so now I have a house with an attic space, and a lower level. The first thing I would do at this point is start working on the roof. In Scurvy, that house has a nice colonial-style tiled roof that goes along with the theme of the map. In order to create that roof, I had to know what a colonial roof looked like. Google Image Search is your friend. Find an image of a roof that you want to recreate and bring it into Fireworks. It’s at this point that you will need to start rebuilding the roof, piece-by-piece. MnP’s method is to recreate something as though we were actually building it for real. So I first analyze how things stack on top of one another. I noticed in Scurvy that the tiles on top are actually on top of the tiles below it. Then there was a long beam that supports both layers of tiles under that. So I began with that beam. Then I added the first layer of tiles on top of it, and finished with the ones on top. Each tile is simply a shape – either a triangle or rectangle or something – with its vertexes moved around to make it look like a roof tile. Don’t worry about the colors at this point either, just make all the tiles red or something. Later, you can come back and change individual tiles to the colors that you want. 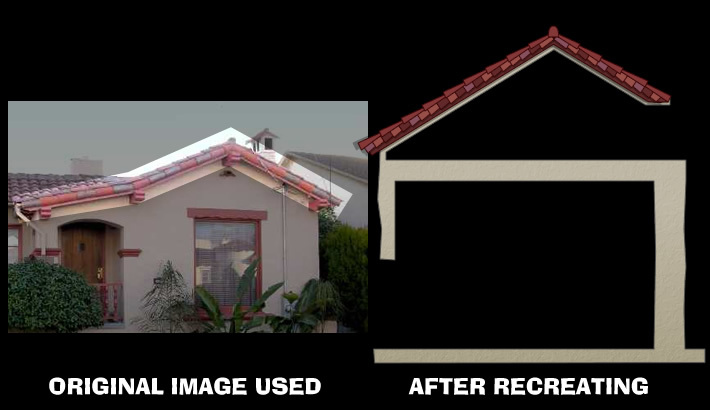 Scurvy’s red roof tiles use 3 or 4 colors to create a natural variety. Another good tool to use at this point is the drop shadow tool. You can make the tiles look slightly 3D by giving them a very small drop shadow. MnP always uses solid shadows at 30% – 40% saturation – this means no blurry edges to the shadow. Think… cartoon style shadows. D. Hmmm, this doesn’t look like Scurvy’s house – And it probably at first. But don’t give up! MnP has been doing this type of work for 10+ years and it takes practice. But at this point in a map, I always recommend sticking with the current part of the map until it is basically done. Don’t go and start another section to give yourself a break from your current task. Detail that house like crazy – it will keep you inspired and give you a glimpse into the finished product once that portion is done. First, there are the wooden beams (holding up the roof). 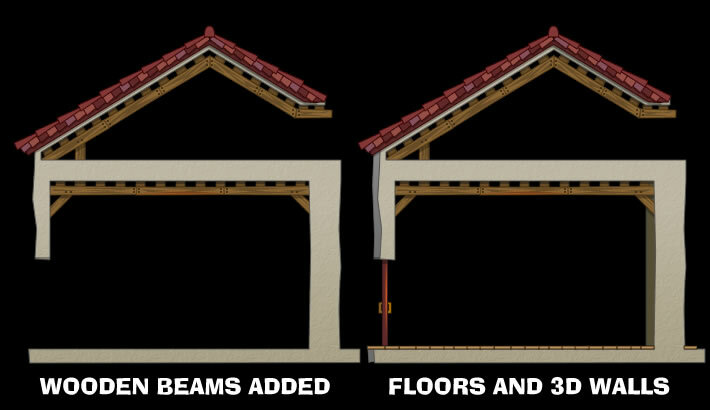 For the beams, tackle that the same way you would the roof tiles – piece-by-piece. A wooden beam is nothing more than a rectangular shape with some erratic lines on it to simulate wood grain. If you need to see what wood grain looks like, use Google Image Search! Add some nails to the beam where one attaches to another (just small circles), assign subtle drop shadows to the right parts, and you’ll be roofer in no time! Another structural detail are those “3D” walls. They really aren’t 3D because you can’t walk in front of them or anything, but they give the illusion of depth to the player. I usually use a standard perspective for the entire map and work with it (ie., the left side would have 3D interior walls on the left side, and the right side on the right). This also helps to give the house some “bulk” when creating the exterior 3D walls. You can also use those walls as a place to show light-sourcing, as the lower room in Scurvy does. More on that later. In a nutshell, a 3D wall is just another shape placed behind the main wall shape and given a darker color. Finally, you’ll want to place some kind of flooring in your rooms. The Scurvy house attic has no flooring (intentionally), but the dining room has a nice wood plank floor. Those wooden planks are just rectangles, aligned next to each other. 1. Use Google Image Search to find a specific furniture piece or object that you want to put in your map. 2. Bring that image into Fireworks and recreate it piece-by-piece. I usually design it right over top of the source image if I can, and I usually make it much larger than the scale I am working with for the map. Also, do not over detail something when you are working with it in a larger scale than your map. 3. When you are finished, group all the vectors you used for the furniture piece and copy them over to the map document. It can now be scaled down in size to fit into your proportions. If you over detailed it in the large scale, you’ll lose most of that in the downsizing at this point. Now is the time to fine tune the vertexes and shapes. Also, decide on a good position for the object in the room and add light sourcing (explained below). Position is important in the room because you’ll need to make sure it doesn’t block anything or make for too many difficult spots for worms to maneuver in (unless that’s your intent). Light-sourcing is so much fun in Worms map design. Of course you are going to need to design the object that is supplying the light (a lantern, chandelier, light bulb, etc.) or simply use the “sun” coming in thru a window as the source. This is where gradient fills like Linear, Contour, and Elliptical come in handy. Apply those fills to the shapes that would receive light, and you’ll see how a bland piece of furniture can come alive as it interacts with the virtual light in your world. Fireworks also allows you to apply textures to objects. We use them, but we do it sparingly, no more than 5% saturation at the most. Contour gradients can also make your objects pop on the page. Experiment with the various fill and gradient types to see what you can do. F. Is that it??? – Well yeah, that’s pretty much it. Of course each room will present its own unique set of challenges, but the basic formula is the same. Google Image Search, recreate piece-by-piece, scale down, and detail. Eventually you’ll have one room done, and then another. It will take time, and lots of it. But it works. The same formula applies to outside areas as well. For a closer look as to exactly how this house was created, click here to download the Tutorial PNG file. It is Fireworks CS5 compatible and it includes all vectors used in this Tutorial. Throughout the process, you’ll want to play your map over and over. Even if you only have a drab gray terrain with just those hollowed out rooms in it, it’s a good idea to quickly test it. This will help prevent some design issues and save time down the road for things you realize you have to change. Always test whether your target worms (Worms Armageddon worms are smaller and don’t jump as high as Worms Reloaded worms) can make it through the various passages and over the variety of obstacles you have set up. Hmmm…. did I cover everything? Not a chance. But hopefully what was covered may at least help some to be better equipped to design Worms maps. I know there would be no way for me to personally explain everything, but I can truthfully say that the above techniques and methods are exactly how we create our MnP maps. Of course this is probably not all that will be said about this subject. So leave comments here and if you have any further questions, those too, and I will attempt to clarify or edit this tutorial to be more helpful in the future. Now… on to making more maps.